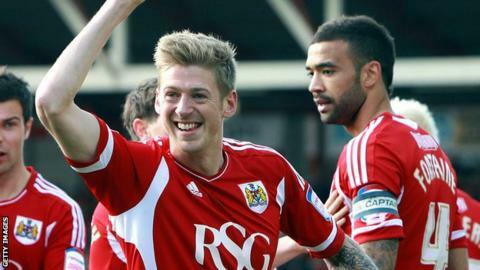 Jon Stead scored twice as Bristol City gave their survival hopes a boost with an emphatic win against Barnsley. Stead nodded in the opener before Liam Fontaine stabbed in a second. City scored two quick goals after the break, Stead converting Fontaine's pass and Lewin Nyatanga heading home. Chris O'Grady poked in for Barnsley but Steven Davies slotted home a fifth for City before Tomasz Cywka's volley and Jason Scotland's long-range goal gave Barnsley some respectability. The victory was Bristol City's fourth in succession at home and moves them to within three points of safety. For Barnsley, it brought an to end a six-match unbeaten run and meant they dropped to 21st in the table, two points above the drop zone. Stead was lively from the outset and headed over the bar before he was prevented from getting a shot off by the challenge of Stephen Foster. However, the former Blackburn striker put the home side ahead in the 16th minute, applying the finishing touch after Marvin Elliott headed on Paul Anderson's corner. Keeper Tom Heaton protected the Robins' advantage in the 27th minute when he kept out Martin Cranie's close-range header. It proved to be an important intervention as Fontaine's close-range finish soon after doubled City's advantage. The victory was as good as assured when City scored two quickfire goals, Stead tucking in his second of the game with the ball taking a slight deflection on its way into the net and Nyantaga heading in from six yards. O'Grady stabbed in following a goalmouth scramble to briefly threaten a potential fightback, but City restored their four-goal advantage when Davies pounced on a poor back pass to fire beyond Luke Steele. Barnsley rallied in the latter stages as Cywka volleyed in from the edge of the area and Scotland made it 5-3 with a shot from distance in stoppage time. But City had already done enough to take all three points which will undoubtedly give them a real confidence boost as they look to avoid relegation. Bristol City manager Sean O'Driscoll said: "I said after our defeats at Cardiff and Crystal Palace that the spirit had not been knocked out of us and this display proved it. "We still have a long way to go, but if the players can maintain that level of commitment we will give ourselves a chance. "Our home form is good and we have improved in away games without getting any reward as yet." Barnsley manager David Flitcroft said: "I knew our great run had to end somewhere, but the way it ended surprised me. The goals we conceded were very poor. "We couldn't defend set-pieces and it is back to the training ground in that respect. And we couldn't handle City's strikers. "Jon Stead and Steven Davies out-muscled us for most of the game. But we will dust ourselves down and come again."